The sport of freediving lost one of its premier athletes this week. Esteemed Russian freediver Natalia Molchanova was diving recreationally off the eastern coast of Spain on Sunday, when she attempted to descend, untethered, to what for her was a modest depth. She never resurfaced. Molchanova is a legend in freediving circles. She holds dozens of world records, is a 23-time world champion, and is regarded by many as the greatest athlete in the sport’s history. Given her extensive experience, the circumstances surrounding her disappearance are puzzling, and make her presumed death the most shocking in recent memory for the sport of freediving. In November 2013, a deepwater diver named Nicholas Mevoli died at a freediving competition in the Bahamas. Mevoli was pronounced dead shortly after attempting to set an American record in constant weight apnea without fins, an event in which the diver descends to the greatest depth possible before ascending to the surface, entirely under his or her own power. It is regarded as the most difficult of eight freediving disciplines, and the most dangerous. The International Association for the Development of Apnea (aka AIDA, the global federation for freediving), said at the time that Mevoli was the first athlete to die in an international competition in the organization’s 21-year history. But Mevoli, despite being a highly capable athlete, was a relative newcomer to the sport, and perished after pushing his body to untested limits. 53-year-old Molchanova, by comparison, was a seasoned veteran, and disappeared not during an AIDA-sanctioned event, but while diving for fun with friends and family. Just this May, she set a new world record in women’s constant weight apnea without fins, sinking 71 meters (233 feet) and returning to the surface under her own power. On Sunday, she is believed to have been swimming at a comparably shallow depth of just 30—40 meters. [Molchanova was diving] two miles west of La Savina at Poniente de es Freus, a part of the sea where currents at the surface and at depth can be unpredictable and powerful. Was she swept away by a strong current? Did she black out? Was there a shark? Did she hit her head on something? ...The water temperature in the area was about 79 degrees, though a layer of water known as a thermocline can be 10 to 15 degrees cooler about 65 feet below the surface. Such a variance can shock a diver’s system. All of these techniques and training methods carry with them a significant risk to one’s safety. Exceeding the limits of oxygen deprivation can lead to loss of consciousness [in freediving, “almost all the top athletes have lost consciousness at one time or another”] or even to death, while extended exposure to pure oxygen [a common pre-dive preparation method] carries its own set of risks. Hyperventilating [another common pre-dive procedure] can cause you to pass out, and there is evidence that suggests buccal-pumping [a technique by which the oral and pharyngeal muscles are used to hyperinflate the lungs, one mouthful of air at a time] can actually cause your lungs to rupture. It is for these reasons that freedivers rarely practice breath-holding unsupervised, or in or around even shallow water; after all: when you’re blacked out, it doesn’t matter how deep the water is. We will probably never know what happened. The AP reports Spain’s rescue services ended their underwater hunt for Molchanova Wednesday, following more than two days of searching. Authorities will continue scanning the surface of the Mediterranean Sea for any sign of Molchanova, and a submersible robotic device, hired by her family, will continue to search below the surface—but her son, Alexy Molchanov, who was diving with Molchanova at the time of her disappearance, said his mother was not expected to be found alive. Contact the author at rtgonzalez@io9.com. 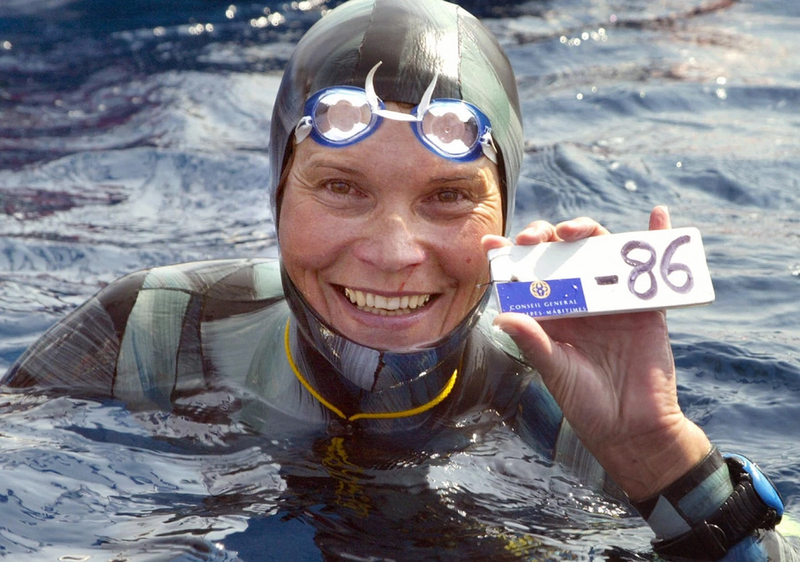 Top photo: Molchanova displays her winning minus-86-meter tag at the first women’s freediving world championship in Villefranche-sur-Mer, France, September 3, 2005. CreditL Jaques Munch/Getty Images.